If you ask people where to get the best Chinese food in San Diego, you’ll end up with a lot of blank stares and mouths hanging open in an attempt to answer. Even Google searches turn up lists that feel embarrassingly inadequate when compared with the likes of Los Angeles or San Francisco. When you search for San Diego’s top Mexican food, you don’t get recommendations like Taco Bell and El Pollo Loco. But without fail, the top lists of the best Chinese food in San Diego all mention Panda Express and P.F. Chang’s -- both homogenized chain restaurants. "There’s a serious lack of visibility when it comes to Chinese restaurants, both literally and figuratively." It’s not that there aren’t any truly great, culturally rich Chinese restaurants in San Diego. The problem is that there’s a serious lack of visibility when it comes to these establishments, both literally and figuratively. However, there is one Chinese food restaurant that hits on all these levels, and in those same top 10 lists, it consistently ranks as number one. My answer, and clearly most of San Diego's too, to the question of where the best Chinese food is Dumpling Inn. Dumpling Inn was always popular, but situated somewhat awkwardly in a tiny part of a strip mall on Convoy St. 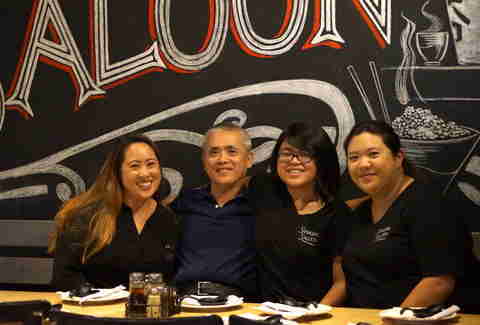 When owner Mark Sun (Khan's Cave and Del Mar Rendezvous) got involved in the picture, he knew a move was critical to long-term success and capitalized on an opportunity to relocate a year and a half ago. As luck would have it, a grocery store in the same strip was moving out. 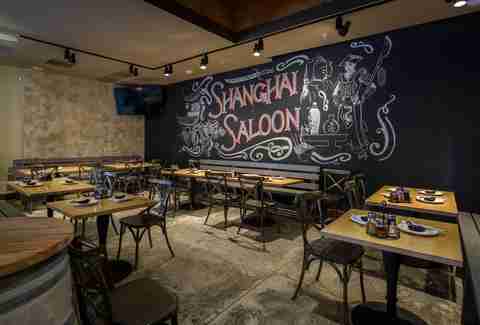 When he made the move, Sun also decided to bring in a new element of intrigue to the already well-established Dumpling Inn by building and housing the newly minted Shanghai Saloon under the same roof. It was a smart move for a lot of reasons, most importantly that the only real criticism Dumpling Inn received at the old location involved the horrible wait to get a table. But a few months ago, Sun quietly decided it was time to cash out and bestow the Dumpling Inn mantle onto somebody else, to the surprise of most. Offers came flooding in once Sun made it known that he was moving on. While there was no lack of applicants, the pool of candidates wasn't turning up many people Sun considered worthy of carrying his torch onward. Some might call it picky, but it’s more accurate to call it determined due diligence. After all, it was this razor-sharp attention to detail that helped Sun put Dumpling Inn and the Shanghai Saloon on the map in the first place. Not one to wait around, Sun took matters into his own hands and sought out a man he deemed one of the best people for the position. He approached Phat (pronounced ‘Pat’) Vuong -- a Chinese immigrant who came to America by way of Vietnam -- and his daughter, Sandy Tobin. Vuong is somewhat of a legend when it comes to Chinese food. 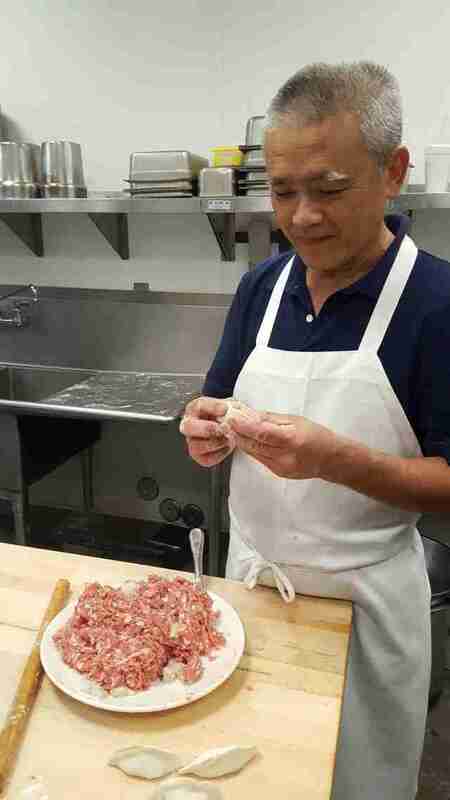 Before he ever purchased Dumpling Inn or opened his first restaurant, Minh KY (which he still operates), he was the head chef at Panda Inn Horton Plaza -- the tree that both Panda Express and P.F. Chang’s would ultimately branch from. His role at Panda Inn gave him the chance to develop the recipes and initial menu for Panda Express. Put another way, Vuong knows what he’s doing in the kitchen. And that's exactly why Sun tapped him. "I knew my dad was important, but I didn’t realize how big my dad’s name really was until we went through the whole process of purchasing Dumpling Inn," says Tobin. "One of the biggest reasons that Chinese restaurants in San Diego are so scarce: there’s a serious lack of experience and willingness to convey cultural tradition to hungry customers." Beyond his prowess with food, Vuong was known as a hardworking single father of three, and an honorable man who prized a good reputation and his word above all else. This was exactly the kind of chef and restaurant owner that Sun was so desperately searching for, and 57 days ago (at the time of publication) Vuong and Tobin officially purchased Dumpling Inn. They currently run the restaurant with a majority of the same staff that worked under Sun. This was a critical move for the new owners: they didn’t want to throw a monkey wrench into an already well-oiled machine; they could maintain levels of expectation with regard to standards; and it made the transition into ownership that much smoother. The only major additions were Tobin’s sisters: Priscila Vuong as the assistant manager, and Christine Dang supporting all aspects of the business. To Phat, carrying on the techniques and recipes that Dumpling Inn and the Shanghai Saloon curated was paramount to the success of the restaurant. To that end, every dish on the menu is handmade, which is something you won’t find in the limited repertoire of other San Diego Chinese food restaurants bowing to corporate, commercialized cooking techniques. We’re all obsessed with food in San Diego. Not only do we crave the finesse of a masterful chef to impart bountiful flavor; we also care deeply about the culture we’re experiencing through a dish. This is one of the biggest reasons that Chinese restaurants in San Diego are so scarce: there’s a serious lack of experience and willingness to convey cultural tradition to hungry customers. 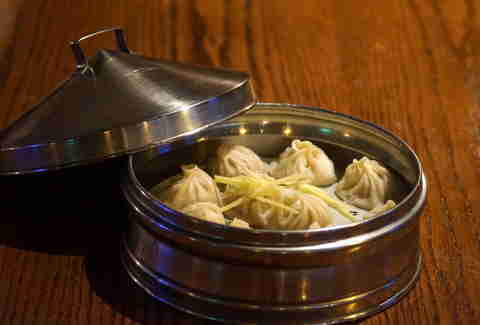 At the same time, that’s also one of the reasons Dumpling Inn has had so much success. It was able to tap into this niche by specializing in a variety of traditional Chinese food dishes ripe with both taste and culture, like the Xiao Long Bao (XLB). Not only is this the dish from which the restaurant carves its namesake, it’s a fiercely traditional, rare dish you won’t find in other top Chinese restaurants in town like Din Tai Fung, Chin’s, China Max, Kip’s Cafe... or even good ol' Panda Express and P.F. Chang’s. What canonizes the XLB is the dough, made fresh every day. Vuong and Tobin insist on doing it this way even though it takes a little more time. If the consistency isn’t perfect, the dumplings will explode during the cooking process. Nobody wants that. Vuong fills each dumpling by hand -- what’s beautiful about them is the absolute uniformity of proportion and aesthetic. It’s a true showcasing of his skill in the kitchen. It’s important to recognize that Tobin and Vuong don’t see other Chinese restaurants in San Diego as competitors. Rather, they choose to view them as neighbors and friends, though they’re definitely proud to offer food that unequivocally ranks higher on everybody’s list of favorites. "We’re not trying to be Din Tai Fung or anybody else," says Tobin. "We’re Dumpling Inn, and our dumplings are an embodiment of who we are." This pseudo-branding is evident everywhere else you look. 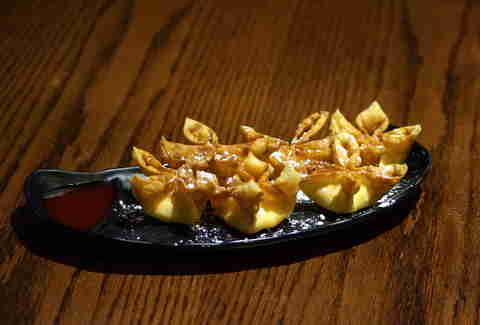 You’ll notice that the pork potstickers, spicy pork wontons, and cream cheese wontons all have flair that distinguishes them as unique. 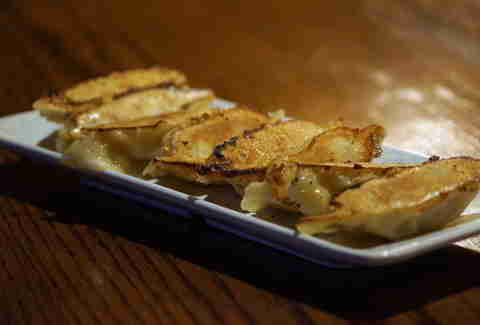 The potstickers are massive in stature and filled with a healthy serving of pork, not to mention they’re pan-fried to a perfect golden crust. Each order of spicy pork wontons arrive at the table swimming in a spicy chili-oil sauce that sits squarely in the Goldilocks zone of heat -- just right -- and are topped with sprigs of cilantro. And the cream cheese wontons have a hint of pineapple inside, finished with a light dusting of powdered sugar. The entrees aren’t left in the dust, either. The handmade noodles are expertly pressed to an even, preferred thickness and length to ensure an even cooking between overdone and al dente. When stir-fried with shrimp and veggies, they take on a wonderfully chewy texture. The garlic baked sea bass is expertly cooked. The fish remains flaky, despite it being served in an abundance of robust garlic sauce. The same goes for the beautifully green, crisp, and fresh bok choy that comes with it. It’s easily the best thing on the menu. Let’s not forget about the Shanghai Saloon, which has 30 beer taps and bartenders that aren’t afraid to experiment with cocktails. 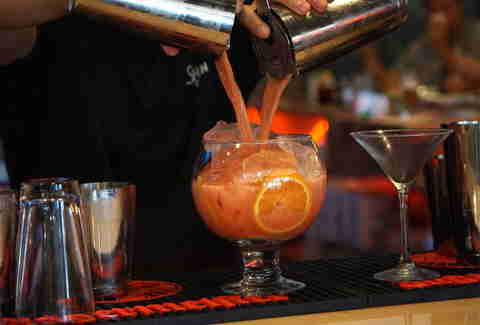 The two most popular are the Fish Bowl, an Asian rendition of the classic Mai Tai, and the Dragon’s Eye, a Cosmopolitan-inspired cocktail finished with blue curacao and a lychee garnish. To go with the craft cocktails, Tobin has taken her personal passion for high-end whiskey and curated a robust list of rye, Scotch, and bourbon that you’d expect to see at an established whiskey bar like Seven Grand in North Park. It’s impressive and calculated, and there isn’t a wasted spot on the shelf. The Hibiki 12 Year is especially smooth and pairs well with the food. "Food is a language that brings us all together." 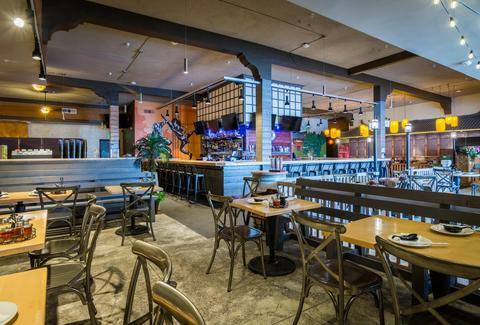 Despite the large size of the new location, Dumpling Inn is able to maintain a mom-and-pop feeling that pays homage to the roots laid down at the original location. It’s the kind of place that infuses soul into the food, and you’re welcomed as part of the family. "We want our dining experience to feel very personal at the end of the day,” says Tobin. "Food is a language that brings us all together no matter where we’re from or who we are. We want to keep that light burning bright." Will Schmidt is a freelance writer, investigative journalist, and an avid devourer of cultural trends. If you ever need to find him, don't forget to check the OB pier -- he's probably surfing! Follow him at @WJS1988.